Location of Sharon in Mercer County, Pennsylvania. 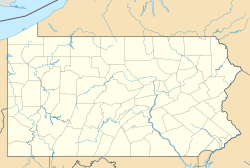 Sharon is a city in Mercer County, Pennsylvania, in the United States, 75 miles (121 km) northwest of Pittsburgh. It is part of the Youngstown-Warren-Boardman, OH-PA Metropolitan Statistical Area. It is the home of the Vocal Group Hall of Fame. The Sharon area was first settled in 1795. It was incorporated as a borough on October 6, 1841, and incorporated as a city on December 17, 1918. The city operated under the Pennsylvania third-class city code until 2008, at which point it adopted a home rule charter under which the elected position of mayor was replaced with a hired city manager and financial officer. The founding families of Sharon first settled on a flat plain bordering the Shenango River, between two hills on the southwestern edge of what is today Sharon's downtown business district. According to local legend, the community received its name from a Bible-reading settler who likened the location to the Plain of Sharon in Israel. Initially a center of coal mining, Sharon's economy transitioned to iron and steelmaking and other heavy industry after the arrival of the Erie Extension Canal in the 1840s. Following the extensive national deindustrialization of the 1970s and '80s, the city's economy diversified and is now based primarily on light industry, education, health care, and social services. The Frank H. Buhl Mansion was added to the National Register of Historic Places in 1977. Sharon is the home of Quaker Steak & Lube and The Vocal Group Hall of Fame. Other local attractions are The Winner off-price fashion store, Reyer's shoes, and Daffin's Candy. Sharon is located at 41°13′48″N 80°29′56″W﻿ / ﻿41.23000°N 80.49889°W﻿ / 41.23000; -80.49889 in southwest Mercer County. The city borders the city of Hermitage to the north and east, the city of Farrell to the south, and on the west the census-designated places of Masury and West Hill, Ohio. According to the United States Census Bureau, the city has a total area of 3.8 square miles (9.8 km2), all land. However, the Shenango River runs through the city and provides drinking water to Sharon and several surrounding communities. As of the census of 2000, there were 16,328 people, 6,791 households, and 4,189 families residing in the city. The population density was 4,342.6 people per square mile (1,676.7/km²). There were 7,388 housing units at an average density of 1,964.9 per square mile (758.6/km²). The racial makeup of the city was 86.44% White, 10.85% African American, 0.21% Asian, 0.18% Native American, 0.02% Pacific Islander, 0.23% from other races, and 2.08% from two or more races. Hispanic or Latino of any race were 0.88% of the population. From the Census Ancestry Question, Sharon has the following ethnic make-up: German 21%, Irish 14%, Italian 11%, Black or African American 11%, English 8%, Polish 5%, Slovak 5%, Welsh 3%, Scots-Irish 2%, Hungarian 2%, Dutch 2%, French (except Basque) 2%, Croatian 1%, Scottish 1%, Russian 1%, Swedish 1%, Arab 1%, Slavic 1%, American Indian tribes, specified 1%. Sharon's Jewish community is served by the Reform Jewish Temple Beth Israel. There were 6,791 households, out of which 28.1% had children under the age of 18 living with them, 40.7% were married couples living together, 16.6% had a female householder with no husband present, and 38.3% were non-families. 33.7% of all households were made up of individuals, and 15.5% had someone living alone who was 65 years of age or older. The average household size was 2.33 and the average family size was 2.97. In the city, the population was distributed with 24.4% under the age of 18, 8.0% from 18 to 24, 27.2% from 25 to 44, 22.0% from 45 to 64, and 18.5% who were 65 years of age or older. The median age was 38 years. For every 100 females, there were 88.3 males. For every 100 females age 18 and over, there were 83.7 males. The median income for a household in the city was $26,945, and the median income for a family was $34,581. Males had a median income of $30,072 versus $20,988 for females. The per capita income for the city was $15,913. About 14.0% of families and 17.6% of the population were below the poverty line, including 25.8% of those under age 18 and 8.8% of those age 65 or over. The Sharon City School District maintains three K-6 elementary schools: Case Avenue, C.M. Musser, and West Hill. It has one combined middle/high school, the 7-12 Sharon Middle/High School. Sharon is home to the Shenango campus of Pennsylvania State University, which offers several two-year and four-year degrees. It also hosts Laurel Technical Institute, a for-profit trade school, and the Sharon Regional Health System School of Nursing. Because of Sharon's location on the Pennsylvania/Ohio border, it is served by WKBN-TV (CBS), WFMJ-TV (NBC), WYTV (ABC), WYFX-LD (Fox) and WBCB (CW), all broadcast from nearby Youngstown, OH. Sharon is served by AM radio stations such as WLOA (1470 AM) (Farrell, PA), WPIC (790 AM), WKBN (570 AM) (Youngstown, OH), and by FM radio stations such as WYFM/"Y-103" (102.9 FM), WLLF/"The River" (96.7 FM) (Mercer, PA), WYLE/"Willie 95.1" (95.1 FM) (Grove City, PA), WMXY/"Mix 98.9" (98.9 FM) (Youngstown, OH) and WWIZ/"Z-104" (West Middlesex, PA). Chisholm, Hugh, ed. (1911). "Sharon" . Encyclopædia Britannica (11th ed.). Cambridge University Press.